Seven lonely days without a word. Did I do something somehow that you heard? Well I'll be fine.. You're not even on my mind. 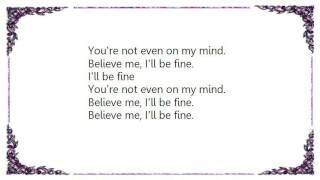 Believe me, I'll be fine. Seven lonely nights without a friend. Something tells me this might be the end. I'll be fine.. You're not even on my mind.